The bright pink fruit with its scaly outer looks exotic no doubt, and probably this is the reason why it dons a mystical name – dragon fruit. Belonging to the cactus family, it gets its generic name drawing from what the locals refer to it throughout Southeast Asia – dragon scales, dragon crystal, dragon pearl fruit or green dragon. 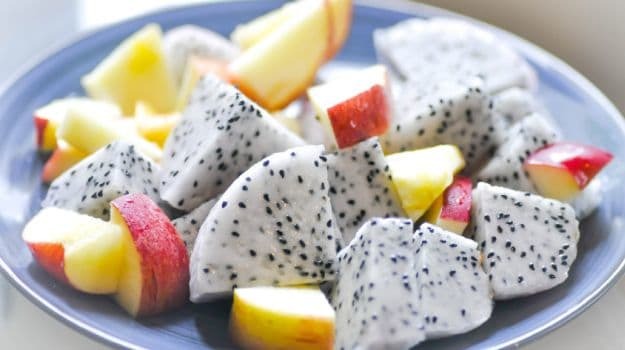 The scaly outer encloses a white or red fleshy inner specked with black seeds, which is sweet in flavour and extremely refreshing. 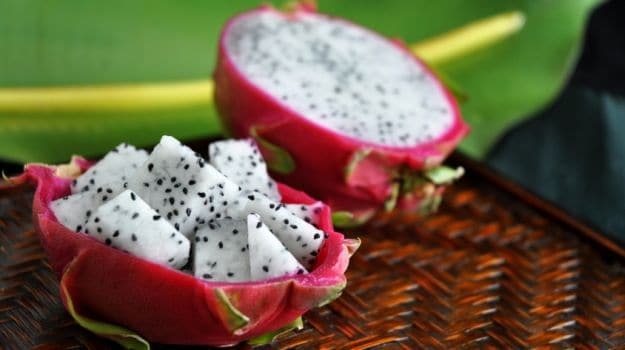 It is said that the best way to enjoy dragon fruit is to eat it as is and fresh. All you need to do is peal the scaly outer and then slice the inner flesh as per your liking or you can even scoop it out using a spoon. Add it to your fruit bowl or drizzle with a little honey and enjoy as a quick snack. It is also commonly used to shake up mocktails and other beverages as it tends to blend well with other flavours. Known as pitaya in Hindi, it is a powerhouse of nutrition, equipped with many health benefiting properties. Moreover, it is low in calories, zero cholesterol and full of antioxidants. 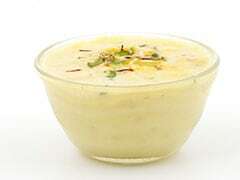 Since it is available frequently in the Indian market, make the most by including it in your diet. Dragon fruit is extremely low is terms of cholesterol, as well as saturated and trans fats. Regular consumption of the fruit can not only be refreshing but also help you in maintaining a healthy heart in the long run. Those of you who are on a weight loss regime, it may be a good idea to include it in your diet. Moreover, the seeds present in the fruit are loaded with omega 3 fatty acids which are essential for your well-being. According to a study done by the researchers at the University of Leeds, increasing consumption of fibre-rich foods can lower risk of both cardiovascular disease (CVD) and coronary heart disease (CHD). 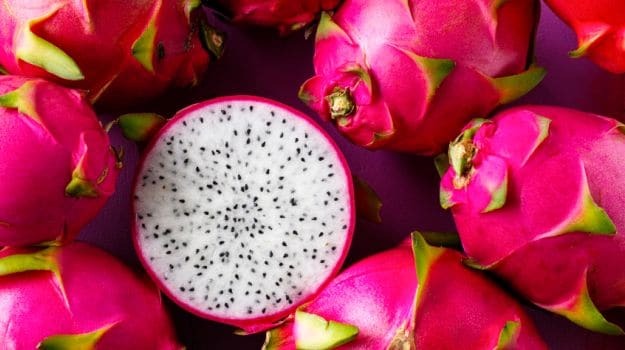 Dragon fruit is a good source of dietary fiber, therefore it is not only great for the heart, but also helps in maintaining blood pressure and weight. Since dragon fruit is a good source of vitamin C, it helps in strengthening immunity, aiding the absorption of iron by the body, producing collagen which makes our teeth healthier, and promoting a healthy and glowing skin. Vitamin C also helps boost your immunity, thereby keeping you from getting sick. 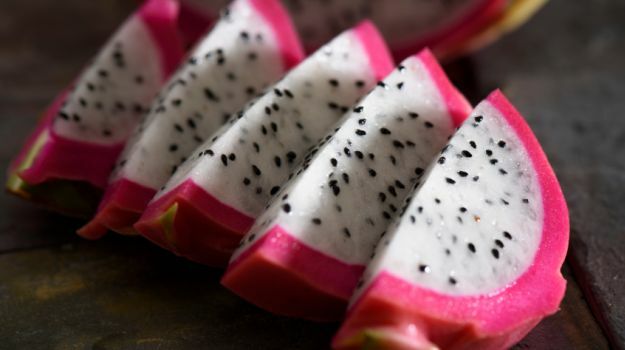 If you haven’t experimented much with dragon fruit in the kitchen, here are two simple recipes to help you get started. The oriental salad makes for a perfect work lunch – light and refreshing, while the smoothie can be your post workout fix or even a healthy breakfast option. A chunky salad bursting with colors of lettuce, dragon fruit, tomato and oranges, along with a vinegar-mustard dressing. 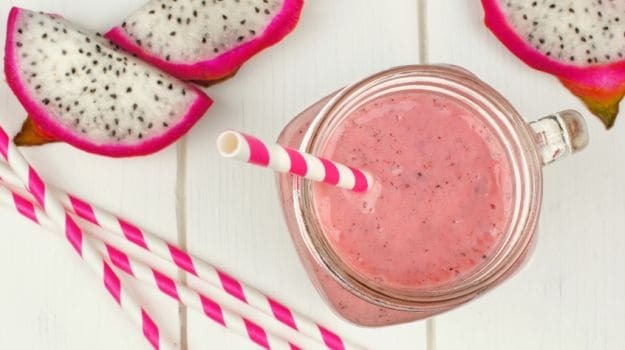 A deliciously creamy smoothie made from yoghurt, dragon fruit and apricots.